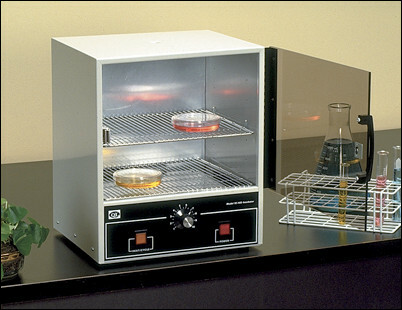 The versatile Quincy Lab Incubator was custom- developed for laboratories that need a dependable, compact incubator for cultures, test kits, eggs and biologicals. It is ideal for clinical, industrial and school laboratories, for physicians' offices and as a general-purpose warming cabinet. The Incubator has a see-thru tinted acrylic door that enables the user to see the entire work space without opening the door. The exterior is attractive ivory baked-on enamel. Beakers, flasks, petri dishes and test tube trays can be processed at the same time. Capacity is 0.7 cu. ft. Temperatures up to 62ºC can be maintained accurately and uniformly. The sensitive heat controller maintains temperatures to+1/2ºC*. Chrome plated adjustable shelf and fixed bottom shelf. Additional shelves are available. A laboratory thermometer is included. Eighteen month warranty. Each incubator is tested and approved before shipment. Comes ready-to-use--no assembly is required. Made by Quincy Lab, Inc. mainline manufacturer of laboratory and bench ovens. *NOTE: All Prices are F.O.B. Quincy Lab, Inc's Factory in Chicago, IL. We will work with you on the best way to ship based on cost and date needed.